The Horn Farm Center CSA share contains fresh produce grown by participants in our Farming Internship Program and Incubator Farm Project. Everything is grown in ecologically healthy ways. We never use synthetic herbicides, pesticides, or fertilizers. By choosing to be a member of our CSA you are supporting aspiring farmers as they develop both horticultural and business skills. 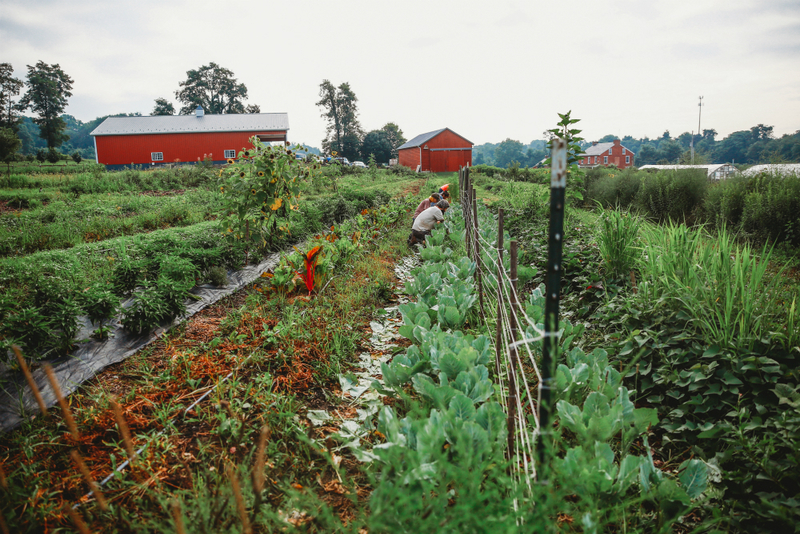 Your membership also helps to fund the Horn Farm Center as we work to connect our community to local food, to provide valuable educational classes and workshops, and to create a model of regenerative agriculture for our region. Our CSA program provides a wonderful opportunity for participants of our Internship Program to learn about succession planting and timing, growing a wide variety of vegetables, harvesting and prepping produce, connecting directly with the consumer, and all of the other inner workings of running a farm operation. By offering a weekly share of produce that combines vegetables grown by our interns with crops grown by our Incubator Farm Project participants, we are providing farmers in our incubator with an additional market outlet. CSA stands for Community Supported Agriculture. In the CSA model, members of the community pledge support to a farm, with the grower and consumers sharing the risks and benefits of food production. The consumer (shareholder) pays a fee at the beginning of the season in exchange for a regular, weekly share of the harvest. The farmer benefits from the financial support at the beginning of the season and the shareholders benefit from knowing they have a reliable, weekly supply of fresh, seasonal, chemical-free produce. The shareholder understands that the unpredictability of weather, pest problems, and other factors may result in some crops being bountiful while others may suffer setbacks. The CSA model is a relationship connecting the land, the grower, and consumer thereby putting us in closer touch with each other and the land which sustains us. Crops included in the shares will vary as different things come in and out of season, with the early season shares tending to be smaller and then rising as more crops come into their peak. We have the following items on our growing schedule this year: Arugula, Basil, Beans, Beets, Broccoli, Cabbage, Carrots, Cantaloupe, Celery, Cilantro, Cucumbers, Dandelion Greens, Dill, Eggplant, Garlic, Green Onions & Bulb Onions, Kale, Kohlrabi, Lettuce, Parsley, Peas, Peppers (Hot & Sweet), Potatoes, Radishes, Spinach, Squash (Summer & Winter), Strawberries, Sweet Potatoes, Swiss Chard, Tomatillos, Tomatoes, Turnips, Watermelon, various herbs, and more. The CSA season lasts 22 weeks beginning in late May or early June until October or early November. Shares are available for on-farm pick-up on Tuesdays at the Horn Farm from 2:30-6:30 PM.